Discussion in 'Muppet Merchandise' started by Phillip, Feb 7, 2014. The most sensational, inspirational, muppetational character encyclopedia ever released! From Animal to Zoot, meet over 200 of the most memorable and best-loved Muppet characters from the 1970s to the present day. Featuring full-color images of each Muppet character with annotations and fan facts written by Jim Henson Legacy President Craig Shemin. Order The Muppets Character Encyclopedia! Save money and help support Muppet Central. If you've purchased The Muppets Character Encyclopedia please "like" this post and share your thoughts below. Chopped Liver, FrackleFan2012 and DutchMuppet like this. Just had the book through today. I'm disappointed in the small size (I was hoping it would be the same size as some of the Star Wars and Lego ones) and quite underwhelmed by the design. That said, it's very comprehensive and I can't see too many obvious omissions (no bill, Gill and Jill) and quite a few surprising inclusions. I'm guessing some people on here will be able to name more missing characters but I'm pleasantly surprised. It does (rather unsurprisingly!) act as an advert for Muppets Most Wanted but, after all said and done, I'm happy with the purchase and it's definitely a mark above what I expected Disney to deliver. How is it an advert for MMW? Does it reveal whether Constantine is the only new Muppet character in Muppets Most Wanted? Does Miss Poogy get a page, is she lumped in a "Moopets" page, does each member of the Moopets get their own page, or are none of the Moopets included at all? I learned yesterday that it doesn't have many characters from The Jim Henson Hour. Does it have any who are more-or-less exclusive to the show? Hearing that there's no Bill, Gil or Jill, it makes me wonder if original characters from The Muppets Take Manhattan and Muppets from Space are featured or not, since Sony owns those films (but surely there's some non-still images they could have used). Though I wonder if Bubba the Rat's in it, since he was in a few other productions (heck, Bill, Gil, and Jill appeared in a few other productions). Does the Kermit page mention anything about his Sesame Street appearances? There's a lot of the already released publicity shots as well as screen shots from the movie used rather prominently throughout. Also, in the bios, they highlight the MMW appearance of many characters. Pre-ordered this book, but my local bookstore said that there were problems and the delivery is delayed in the Netherlands. Somewhere next week I will get it. So what kind of non-character pages are there? I know there's Veterinarian's Hospital and Gonzo's Great Acts, and I figure if it has Vets Hospital it must have a Pigs in Space page. 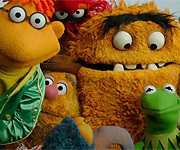 So if Muppets Most Wanted is given a lot of focus for the characters who appear in that movie, does the movie confirm appearances by any characters who previously hadn't been confirmed? Got mine in the mail today too. At only £6.39 delivered I think it's a real bargain!! Few unseen MMW images, like Miss Piggy in the opening number and sat upon a piano in the green dress as used on the new plush doll!! Moopets are all grouped under one page, no reveal of any other characters from MMW. Hilda main image is when she dressed in a wig and pointy glasses!! Some unexpected characters and a great buy!! Wow i can not wait to get mine. Any new photos of Constantine? I'm sad to hear that Droop is not in the book. He's one of my favorite characters. Are characters such as Thog, Beautiful Day Monster, Behemoth, or Gorgon Heap included? Just saw that. And there are some surprises there. I'll try not to spoil much information that I found there. Surprised to see a Sam and Friends section. Does this mean that Disney does own the Sam and Friends characters? Is there a copyright acknowledgement that they belong to Henson (Before You Leap didn't have a copyright acknowledgement for Big Bird, who was pictured in that book)? 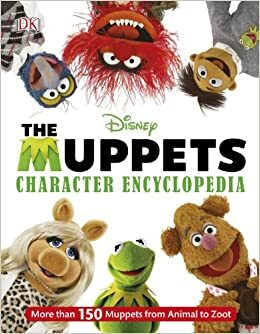 After hearing that most Jim Henson Hour characters wouldn't be in this book, I am surprised by the ones who are included, especially since I wouldn't have been surprised if they didn't appear. Particularly Jacques Roach, since he was recycled and renamed Yves St. La Roache for The Animal Show. Would have thought Henson would own him since he was a more major character on that show. Unless the recycling doesn't matter and both companies can use those identical characters (but they're basically the same character, only with a different name and performer... They even made the roach character French and a cook in both productions). Disappointed that the Muppets Tonight band is referred to as "Jowls and the Muppets Tonight Band". So it only refers to the one member whose name was mentioned on-screen, and we still don't know the actual name of the band? Jim Lewis had said that the band had an actual name but couldn't remember it. And turns out we guessed wrong. Statler and Waldorf both get their own pages. When I saw the Camilla page online, I wondered where that picture of her and Gonzo was from, as I didn't recall seeing it before. It didn't occur to me that it might be from Muppets Most Wanted. Like the rest of you, I was surprised many times by the characters in this book. Gorgon Heap, Splurge, the two Nigel's, Miss Mousey, Brewster, Paul Revere, the Clodhoppers, the Bossmen, were all very unexpected surprises for me. However, what really won me over was the Sam and Friends inclusion. Seeing their name on the list made my jaw drop. I wasn't even aware Disney owned them. 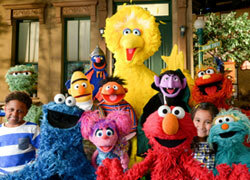 The very characters that Jim started with are with the Muppets again. That's so exciting! I like the fact that Timmy Monster is in the book. Hopefully they explained his absence in the arches in TM! I count 101 individual character pages. Honestly, when I heard this book was first announced, I didn't expect more than 50. Overall, this book is a great surprise, chock full of obscure and old characters, hopefully many more funny jokes and back-stories, and I can't wait to get my hands on it! They did a nice job of character picking! Except i would have loved to see Droop. Wow Sam and Friends....just Wow! How small is the book? is it about the same size as Pepe's "Hard Out Here For A Shrimp" book? I just ordered by copy from B&N and I can't wait for it to arrive!!! I ordered this book that comes out on Monday from B&N!! I was surprised to see that Splurge is in this. Also surprised to see the book has Rufus but not Muppy.